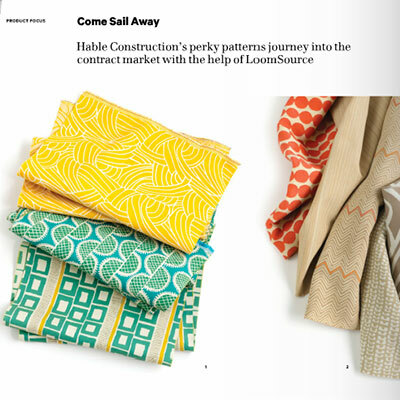 The introductory contract collection, called Port & Cape, alludes to voyages and global destinations, offering something for everyone with its palette of both vibrant and neutral colorways and 14 distinct designs. Shown here are eight of the patterns, which come in a variety of colorways. Bold graphic patterns, for instance, include Tides, a collage of shifting waves; the Hungarian lace–inspired Murano; and the geometric Bali Block. The more subtle or classic styles include the pearl strand–inspired Big Beads; the striae coordinate Bimini; Dhurrie, a light-handed chevron; the traditional Batik; and Rope, which sports freeform swirls. The line isn’t just a pretty face, however. Made for indoor and outdoor use, the fabrics are composed of Bella-Dura®, a yarn made of a byproduct from post-industrial waste, and fully recyclable at the end of its life—properties that earned it Cradle-to-Cradle Silver certification. The textiles are fade-resistant, antibacterial and antifungal, and bleach cleanable.